The demographic makeup of Gamers has broadened significantly over the past decade. More and more gamers are choosing the PC platform as the best place to play. Alienware Command Center was created to give the Gamer a dedicated place to support PC Gaming and transform Windows into a gaming-focused experience where individuals can more fully express themselves. The design team set out to create a robust, powerful application that’s simple and easy to use. The resulting solution gives the user ultimate creative control over their hardware and software environments. 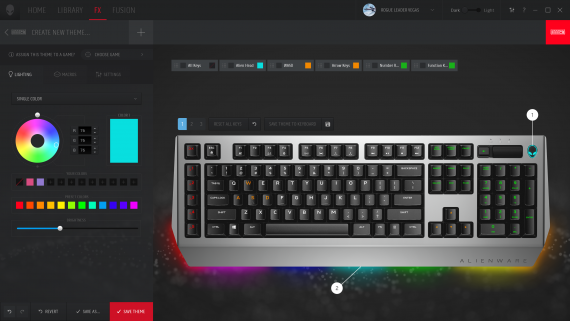 Users can control all aspects of their system through Alienware Command Center to thoroughly express their unique gaming style and tailor their own experience. This includes system and peripheral lighting, power management, thermal control, overclocking, audio, and content organization. Users can dial in the perfect settings to express and experience their own gaming environment and let Alienware Command Center do the work. Gamers will spend more time engaged in their gaming experience and less time configuring their system when using Alienware Command Center.